Happy news is always good. It's been known for a decent amount of time that Suzuko Mimori (Sora in tri. 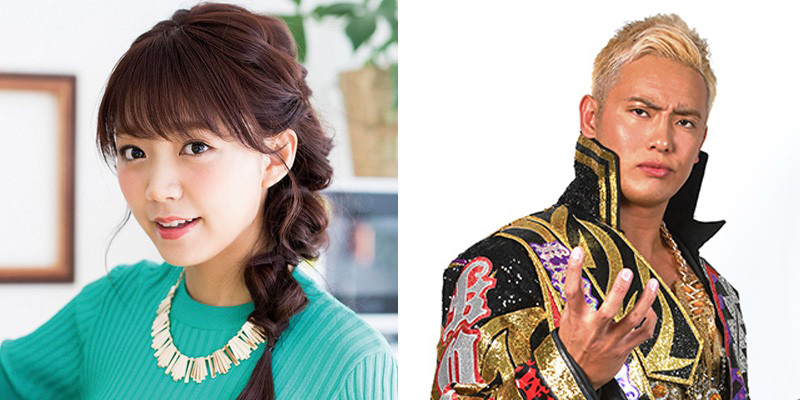 and the upcoming Adventure film) and pro wrestler Kazuchika Okada (Rainmaker) were together, but they both recently announced that they have gotten married. In her Line blog Mimori mentioned that she was still immature as a person, but that she wanted to be bright, fun, warm, and supportive with her family, as her mother was, and she plans to continue to work hard into the future and aim for taller heights and she thanks everyone for their upport. Okada posted to his Twitter that he hoped they can bring a rain of happiness to their home and he hoped to continue thanking everyone in the future. I'm not sure it's been stated 'exactly' how they met, but Okada is an insanely popular wrestler for New Japan Pro-Wrestling and is a huge anime and game fan (apparently he got interested in wrestling playing a wrestling video game when he was younger), and NJPW is owned by a few different companies that are involved in anime & other entertainment industry productions, along with with Okada cameoing in anime and games it's easy to see that they very well may have met at an anime or game event or at a production studio. Always fun to be able to report happy news! Thanks to onkei for the news and clarifying some details. Crazy to think these two are tying the knot, I hope it's their happily-ever-after. How many Digimon actors and actresses are married anyway? I suspect quite a lot of them since they are in their 30s to 40s. Now he'll make money rain on both of them. As I said on Twitter. But thanks to it being aired on TV, I'm invested in NJPW. As you may seen on Twitter. But Okada is a big name there. One of his ring entrances involved dropping dollars with his face on it. Like, a bunch. But this is great. Meanwhile, he, and many other NJPW wrestlers, were in Tiger Mask W. The title character is one in the line of the famous anime/wrestler's line. Sadly, few if any voiced themselves but it was really fun to see that. It's on Crunchyroll. Also, if you think Okada's a big fan of stuff, see what famous wrestler Kenny Omega does. Not only is his finisher named after a game theme, but he did a commercial for an idol music game. it's easy to see that they very well may have met at an anime or game event or at a production studio. So yeah, it's likely they met in Tiger Mask-related events. I wonder if she'll ever end up making her debut as real-life Springer? Also, everybody should watch Tiger Mask W.
Agreed. Everyone should. And Makabe kind of had to voice himself. With how his voice is so noticeable. Oh wait, she played the girl MC? ...That explains a lot.